Gaziantep – Wednesday, 20 April 2016 – The Syria Recovery Trust Fund (SRTF) today signed the financing agreement of its new “Enhancing Food Security of Aleppo and Idleb Governorate – Phase II” project. 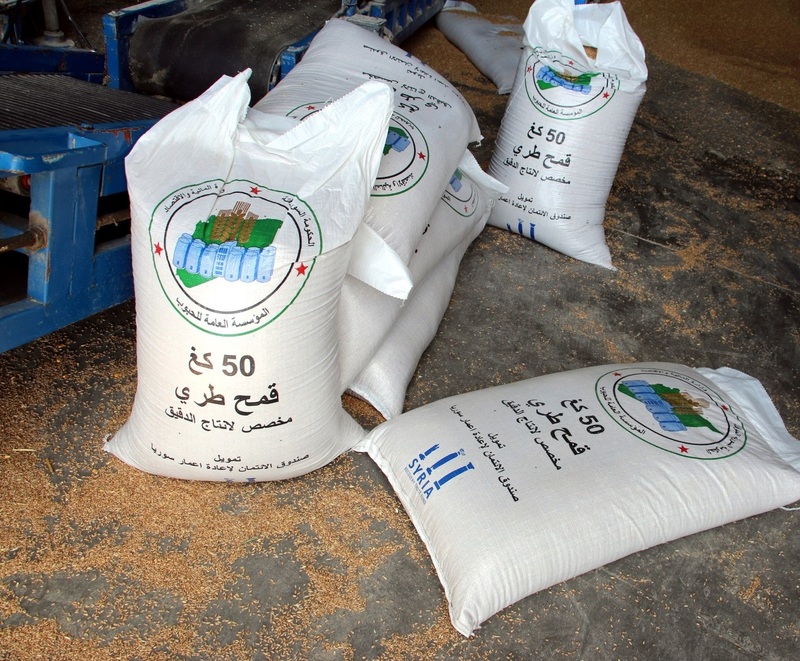 At a total cost of EUR 13.74 million, the new intervention aims to overcome food insecurity in the two governorates by supporting the Syrian Public Establishment for Grains (SPEG) in carrying out a series of activities. On his part, the SRTF Director-General emphasized the SRTF “commitment to alleviating the suffering of the Syrian people by supporting its partners inside Syria in providing essential services.” He said: “the year 2015 witnessed a large number of SRTF interventions in six different sectors, of which over two million people in five governorates of Syria have benefited.Eng. Khabbaz thanked SRTF donor countries and other member states for their continuous support to the fund..” The donors have so far provided some EUR 147 million to support the SRTF operations. The new project includes import and installation of two new milling plants, 50 mt/day each, laboratory equipment, and supply of fuel to operate the electricity generators needed to power the plants. The project will also ensure procurement and import of 15,000 tons of soft wheat to supplement local hard wheat for bread production and 1.76 million Hessian sacks for wheat and 1.25 million Polypropylene sacks flour packing. The Hessian sacks serve local farmers to pack, store and transport their grains while the Polypropylene sacks serve milling plants to pack store and transport flour. Other components of the project include procurement of Polyethylene Sheets for protection of harvested piles of wheat grains, phostoxin and rodenticide to protect wheat crops against insects-fumigation, mill workers safety and protection clothing and gear and fire extinguishers. The project also covers civil works such as building structures to house the new mills; maintenance support and transportation of goods. The project is expected to have a highly positive impact in terms of creating an environment of confidence for the local farming community with regard to the cereals market and for the population with regard to the availability of reliable supplies of flour to local bakeries. It will also have a stabilizing effect on pricing for bread and the locally produced wheat. Wheat bran as a milling by-products will be sold to the livestock feed producers securing additional income to SPEG and contributing to the availability of animal feed, especially for the poultry sector for production of meat and eggs. Once the project is completed the total number of flour mills supplied and funded by the SRTF will reach seven milling plants with total milling capacity of over 315 mt/day of wheat. The SRTF would have also equipped 20 cereals laboratory centres. In addition, it would have supplied 27,000 mt of wheat, 4.7m of Hessian Sacks, 2.3m flour sacks.